The infamous impenetrability of the X-Men franchise is only partly due to the characters; the constant title changes and reboots can really throw a wrench in the works. For instance, X-Men Legacy Vol. 1: Divided He Stands follows the numbering from the Claremont and Lee "Adjectiveless" run and Grant Morrison’s New X-Men. Admittedly, as the title modifier implies, X-Men Legacy is targeted more towards long-term fans, with Professor X, Gambit and Rogue as its core characters. Mike Carey and Christos Gage, both of whom are continuity hounds, guided Legacy through most of its run. Carey’s first arc on the book spans two trades (technically three, but Original Sin is really its own story), with a massive cliffhanger between Divided He Stands and X:Men Legacy Vol 2: Sins of the Father. We all know that Professor Xavier is a jerk, but the act that caused Kitty Pryde to make that statement doesn’t even rank on the litany of questionable decisions brought up here. 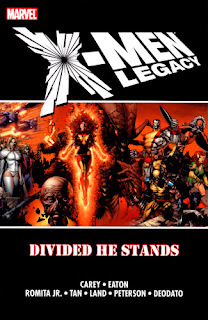 Divided He Stands takes place directly after the Messiah CompleX [sic] crossover which introduced Hope Summers and revealed that Bishop is evil . . . ish. (That neckerchief was always suspicious.) The story opens with Xavier almost dead from a headshot by Bishop. He’s been saved by the Acolytes, Magneto’s former followers now under the command of the ancient mutant Exodus. The first chapter is confusing if you’re not up on your X-history or if you haven’t read Messiah CompleX directly beforehand. Carey, however, knows this, and much of the rest of Divided He Stands revolves around flashbacks and more familiar characters. As part of Xavier's mental therapy -- along with some bouts of mental torture along the way -- he's forced to observed the bad decisions he made. Some time is spent on the infamous Deadly Genesis mini-series which revealed a massacred X-Men team that existed right before the introduction of the “All-New, All-Different” team. Another point of focus is from back in the '60s, when Xavier faked his death and forced Jean Grey to not tell anyone that he was hiding in the basement. In fact, the one thing that Mike Carey doesn’t focus on which I wish he would have is the Onslaught incident; we do see Xavier’s mindwipe of Magneto, but their status as a merged entity goes mostly undiscussed. The aforementioned cliffhanger comes in the form of Mister Sinister, who as it turns out was a key part of Xavier’s childhood. This retcon, explored in the first part of the Sins of the Father trade, actually makes a lot of sense. Since Sinister is at least 150 years old, he would naturally go after other powerful mutants long before he went after Cyclops. Some of this storyline ties into the “New Son” story from the old Gambit title and the Black Womb character who helped Sinister manipulate Gambit’s genetics. Some of the weirdness -- like the emaciated and elderly Black Womb wearing a corset -- is overruled by some key character moments, such as Xavier having to leave the Korean War due to the stress to his mind caused by the death and destruction around him. Gambit also enters the story at this point, joined by Sebastian Shaw of the Hellfire Club, who, like Xavier and the Juggernaut, was one of the children tampered with by Sinister. However, the best part of Sins of the Father is near the end of the story as Xavier returns to the new island home of Utopia. His mental coercion to have Cyclops come out to meet him in the forest is the last straw in a long line of manipulation, as the White Queen enters the professor’s mind just to make sure that all traces of Sinister are gone. It’s just a bonus for them that they get to walk through Scott’s childhood and see how Xavier’s secrecy affected his life. Flashbacks by Marco Checchetto are done in a sepia filmstrip style to fit in with a “home movie” motif provided by Emma Frost. Unfortunately, the relationship between Scott and Xavier was too far gone to repair (as readers of Avengers vs. X-Men know too well). So why was this split into two trades instead of one? I think part of it might be because the massive Rise and Fall of the Shi’ar Empire and Supernovas trades scared away some potential readers. Another reason is that Marvel wanted to collect two one-shots in Sins of the Father that fit well into the main themes of X-Men: Legacy. The first one, Odd Men Out, printed two previously unseen stories by the late Dave Cockrum. While the stories -- one featuring Professor Xavier playing catch-up with classic supporting character Fred Duncan, the other following the classic New Mutants on winter vacation -- aren’t too great, I admire the tribute. The other is a weird and fourth-wall-demolishing story by Stan Lee in which Magneto and Xavier beg Lee to give them a break from their hectic lives. This one probably could have been left out entirely, but I can’t argue with collecting as much as possible. After X-Men Legacy Vol. 1: Divided He Stands and X:Men Legacy Vol 2: Sins of the Father, I still have a lot of catching up to do on Mike Carey’s X-Men: Legacy. He has a Geoff Johns-like sense of how to make continuity work in his favor. Next week, we’ll see that at work in a great alternate universe crossover.